Well, the e-commentary was last updated on April 25, that's not a month yet. But yes, they've been better at it before. 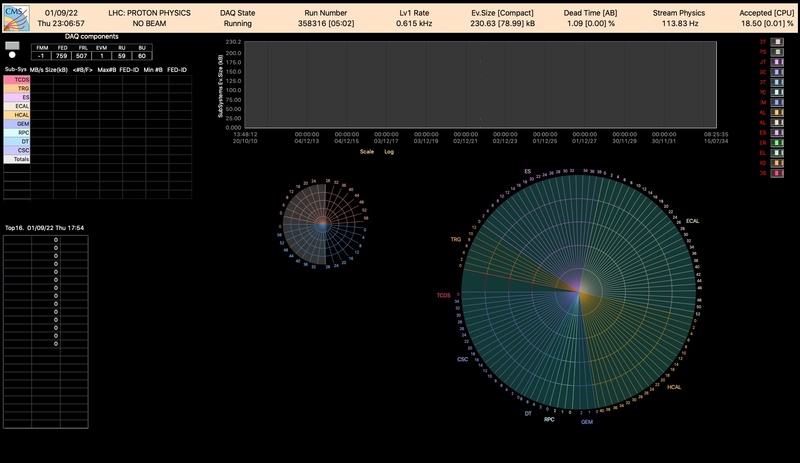 Every refresh (~30 sec) the lower left corner changes through LHC Page1 and 2 event displays. If you ctrl + to enlarge the screen you can make out the info. PS. if you use Meltronx daq panel http://meltronx.com/lhcdatawide/daq.html as a source it will auto update. PS. if you use Meltronx daq panel http://www.acdcind.com/lhcdatawide/daq.html as a source it will auto update. Still not good enough for those of us who would like to stay updated through social media, etc. As a high school student just gaining interest this would be the best place for a thing like this to start is in an online portal that is easy to understand. I feel like being more active in social media would be a good base for a person like me trying to learn. You might want to look at this I think - http://twitter.com/lhcstatus realtime twitter posts of the Page 1 operator messages, of course there aren't much at the moment. Alternatively there is this http://announcer.web.cern.ch/announcer/ a voice announcer for the LHC machine events. yeah... CMS has not updated .. its pretty sad ..